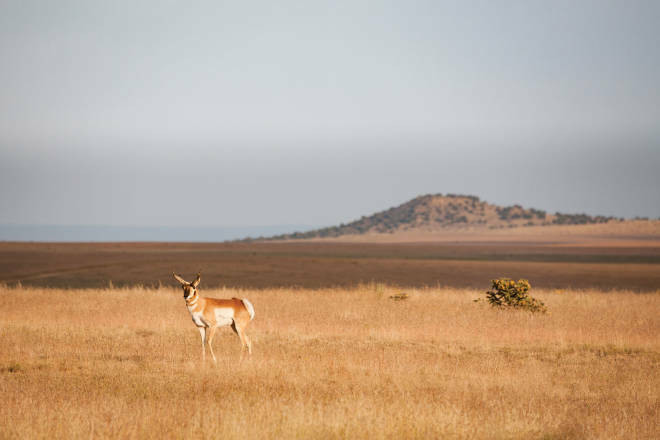 Above: A pronghorn roams the grasslands near Cimarron. Learn more about author Jack Schaefer and the reissue of his most famous stories in Books. He is the one remaining member of his once numerous family. He is the one and only living native American bovid. He has been just about what he is now for at least a million years. He was here when the musk ox arrived. He was here when mammoths and mastodons and giant sloths and dire wolves and saber-toothed tigers roamed our continent. He was here when the modern bison came as immigrants. … He is a true American. … I have read accounts of people cruising in a car at 60 miles per hour and having a pronghorn not only keep pace but move on ahead and cross over. A week-old pronghorn fawn can outspeed any man. A three-month can leave a good horse behind. An adult could win the Kentucky Derby before the equine entrants had much more than passed the halfway mark. He is the perfect running machine.